While workers suffer a wide variety of injuries on the job, those caused by overexertion, falls, vehicle accidents, and getting struck by an object are some of the most common. More than 5,000 workers are killed every year in their workplace, while more than four million more suffer serious injuries that result in long-term health problems and disabilities. In 2016, there were reports of 5,190 workers who died from fatal on-the-job injuries. Workplace injuries can occur in any type of occupation, but some have more serious consequences than others. Workers in office jobs, hospitals and medical facilities, restaurants, construction, industrial jobs, and public service suffer from a variety of workplace injuries each year. According to the National Safety Council, a worker is injured on the job every seven seconds. That equates to 12,300 injuries each day and 4,500,000 injuries each year. Studies show that most of these injuries are preventable. Workplace injuries cause a variety of health problems for workers that keep them off the job during recovery. Even minor injuries such as sprains and strains, cuts and lacerations, and chronic pain contribute to thousands of lost work days each year. When workplace injuries occur, both workers and employers suffer the consequences. Workers are forced to deal with physical injuries and medical bills, and employers are forced to deal with a shortage of workers, slower production schedules, and lost revenue. Overexertion injuries are caused by lifting or lowering, pushing or pulling, holding, carrying, throwing, and repetitive activities at work. Overexertion injuries are the number one workplace injury, accounting for 34 percent of on-the-job injuries. They account for the most workers’ compensations claims and medical expenses each year. The second-leading workplace injuries are slips, trips, and falls. They include slipping on wet floors, tripping over objects, and falls to the same level. Slips, trips, and falls account for 25 percent of workplace injuries. They often result in serious injuries including fractures, broken bones, and head trauma. Falls from heights are commonly seen in construction jobs, industrial warehouses, and shipping industries. Falls often happen from elevated areas like rooftops, scaffolding, ladders, second stories, and stairways. They can happen from taking a wrong step or from defective equipment. Many falls from heights can be prevented by proper safety restraints and equipment. Reaction injuries are caused by slipping and tripping without actually falling. Twisted body movements caused by grabbing for protection to prevent a fall often result in pulled ligaments and muscles, sprains and strains, cuts and abrasions, and other trauma to different parts of the body and internal organs. Although these types of injuries may seem trivial, they can result in long recovery times. Objects that fall from overhead areas can cause serious injuries, even fatalities. 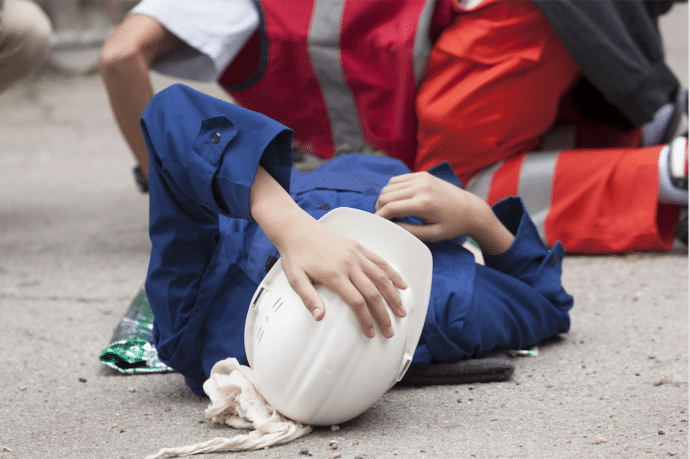 Head trauma is a common injury suffered from falling objects in the workplace. Heavy boxes, tools and equipment, and various objects that fall from heights are dangerous. Workers in construction jobs, manufacturing plants, and shipping warehouses are at high risk for these injuries. The Occupational Safety and Health Administration (OSHA) oversees workplace safety regulations and programs for all types of businesses. OSHA works closely with businesses and employers around the country to implement safety programs in the workplace that prevent on-the-job accidents and protect employees from illness, injury, and death. By implementing OSHA workplace safety programs, employers can ensure a safe workplace environment for their workers. Failing to identify workplace hazards is a leading cause of workplace injuries and fatalities. OSHA safety regulations require all employers to identify workplace hazards by performing regular inspections of work areas and equipment. Hazards that can cause on-the-job injuries to workers must be prevented. Any hazards that can cause slips, trips and falls, exposure to defective equipment, and exposure to toxic or flammable liquids or chemicals must be addressed to prevent accidents and injuries. According to OSHA safety regulations, employers must control or eliminate all workplace hazards that may cause physical harm or death to workers. OSHA’s Alliance Program provides workplace safety information, employer guidance, and employee training to all types of businesses, professional organizations, educational institutions, and community programs around the country. The Alliance Program raises awareness on workplace safety. It addresses employer and employee concerns on workplace safety and explains violations for not complying with OSHA safety regulations. Workers are encouraged to participate in discussions on workplace accidents and injuries, as well as healthcare rights and employer responsibilities. The Alliance Program also helps employers and workers understand the necessary procedures for filing workers’ compensation claims when workplace injuries or fatalities occur.